"SCMP" redirects here. For other uses, see SCMP (disambiguation). The South China Morning Post (also known as SCMP or The Post), with its Sunday edition, the Sunday Morning Post, is a Hong Kong English-language newspaper and Hong Kong's newspaper of record, owned by Alibaba Group. The journal was founded by Australian-born revolutionary Tse Tsan-tai and British journalist Alfred Cunningham (formerly with China Mail, Hong Kong Daily Press and New York Sun) in 1903. The first edition of the paper was published on 6 November 1903. The journal's circulation has been relatively stable for years—the average daily circulation stands at 100,000. It was owned by Rupert Murdoch's News Corporation until it was acquired by real estate tycoon Robert Kuok in 1993. On 5 April 2016, Alibaba Group acquired the media properties of the SCMP Group, including the South China Morning Post. According to a 2016 public survey conducted by the Centre for Communication and Public Opinion Survey at the Chinese University of Hong Kong, the South China Morning Post received a credibility rating of 6.54, the highest credibility score among the various paid newspapers in Hong Kong. South China Morning Post Ltd was founded by Tse Tsan-tai and Alfred Cunningham in 1903. The first edition of the paper was published on 6 November 1903. From its founding, during the Qing dynasty until 1913, one year after the establishment of the Republic of China, it was known, in Chinese, as 《南清早報》 (Naamcing Zoubou, lit. South Qing Morning Post). In 1913, its Chinese name was changed to 《南華早報》 (lit. South China Morning Post) following the Xinhai Revolution in 1911 which overthrew imperial rule in China and has remained as such since then. The Chinese name of Sunday Morning Post is 《星期日南華早報》 (Singkeijat Naamwaa Zoubou lit. Sunday South China Morning Post). In November 1971, it was listed on the Hong Kong Stock Exchange. It was privatised by News Corporation, owned by Rupert Murdoch, in 1987, and relisted in 1990. Malaysian tycoon Robert Kuok's Kerry Media bought the controlling interest – a 34.9 per cent stake – from News Corp in October 1993 for US$375 million. His son, Kuok Khoon Ean, took over as chairman at the end of 1997. Kuok Khoon Ean's sister, Kuok Hui Kwong, was named chief executive officer on 1 January 2009. Kuok launched a general offer for the remaining shares in September 2007, and increased his stake to 74 per cent at a total cost of HK$1.63 billion ($209 million). It was delisted in 2013 when the shares' free float fell below the required 25%. On 11 December 2015, it was announced that Alibaba Group would acquire the media assets of the SCMP Group, including the South China Morning Post. The consideration is reported to be HK$2.06 billion ($264 million). The consideration – similar to the amount Jeff Bezos paid for the Washington Post – represents 10 times earnings before interest, taxes, depreciation, and amortization, compared to 17 times for the Washington Post. On 5 April 2016 Alibaba Group completed the acquisition and SCMP announced it had taken down the paywall of its online version. Readers are able to have free access to all contents on SCMP.com and SCMP mobile apps. The paper's average audited circulation for the first half of 2007 stood at 106,054; while its Sunday edition, the Sunday Morning Post, has a readership of 80,865. In 2012, the readership of the SCMP and the Sunday Morning Post was estimated at 396,000. Its readership outside Hong Kong remains at some 6,825 copies for the same period, again, relatively unchanged. It also had the position as the most profitable newspaper in the world on a per reader basis, profit declined since peaking in 1997 at HK$805 million; yet its growth potential is viewed as being largely dependent on its ability to penetrate the wider Chinese market. Its average audited circulation for the first half of 2015 stood at 101,652 copies, with the print edition representing 75 percent of the number of copies; the Sunday edition registered 80,779 copies on average during the same period. The Group reported net profit of HK$338 million for the year 2006 (2005 = HK$246m), the operating profit of HK$419m (2005 = HK$306m) was attributable mainly to the newspaper operation. The selling price of the paper is HK$9 each from Monday to Saturday, and HK$10 for the Sunday Morning Post. A discounted student subscription is also available. It was increased 14.5% (from HK$7) and 25% (from HK$8) respectively in August 2011. As of 26 August 2010, SCMP Group posted a profit of $52.3 million in the first half of 2010. The printed version of the Post is in a broadsheet format, in sections: Main, City, Sport, Business, Classifieds, Property (Wednesday), Racing (Wednesday), Technology (Tuesday), Education (Saturday), Style magazine (first Friday of every month); the Sunday edition contains Main, a Review section, a Post Magazine, Racing, "At Your Service", a services directory, and "Young Post", targeted at younger readers. On 26 March 2007, the Post was given a facelift, with new presentation and fonts. Another redesign in 2011 changed the typefaces to Farnham and Amplitude for headlines, Utopia for text, and Freight for headers. SCMP.com had started out as a subscription-only service, which also allows the retrieval of archive articles dating back from 1993. It was launched online in December 1996. On 30 May 2007, SCMP.com relaunched with a new look, features, and multimedia content. Headlines and the introduction to stories are now free to view, while the full articles are available to subscribers. Archive photos and articles are available for purchase. On 16 July 2007, SCMP.com launched its first-ever viral video marketing campaign targeting a global audience and highlighting the new multimedia features of the website. 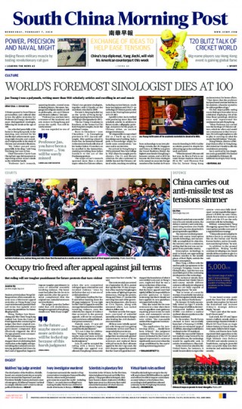 At present, the SCMP also provides free subscription to "The South China Morning Post iPad edition" for the Apple iPad. SCMP.com launched a major redesign on 20 April 2015. Upon having been acquired by Alibaba, the new owners announced that the paywall would be removed. The paywall was subsequently removed on the night of 4 April 2016. By doing so, SCMP wished to increase its readership globally and allow the global community to have access to insightful and trusted news of China. It vowed to better adapt to the reading habits of the readers. The Post weathered 10 editors in 11 years since 2000. Mark Clifford, former editor-in-chief of The Standard from 2004–06, was hired as editor-in-chief of 'The Post' in February 2006. Clifford brought with him several staffers from The Standard, including business section editor Stuart Jackson, who departed after seven turbulent months. He presided over the controversial dismissal of several journalists over an internal prank, and himself resigned with effect 1 April 2007. Following Reginald Chua's short-lived tenure at the Post, from 2009 to April 2011, and deputy editor, Cliff Buddle became Acting Editor-In-Chief for 10 months. Wang Xiangwei (王向偉), a member of the Jilin Provincial Committee of the Chinese People's Political Consultative Conference, succeeded in 2012. Tammy Tam, senior editor of the China section, was elevated to deputy editor under Wang. In May 2015, the Post told columnists Philip Bowring, Steve Vines, Kevin Rafferty and Frank Ching – all of whom have criticised the government in commentaries to varying degrees on different subjects over the years – that their services would no longer be needed. The manner of their dismissal generated criticism, as well as speculation as to who had instigated the removals. In January 2016, Tam was promoted to the paper's editor-in-chief. The previous ultimate owners of the publication, Kerry Group's Robert Kuok and his family, are claimed to be inclined towards the central government of China, and questions have been raised over the paper's editorial independence and self-censorship. The paper's editors nevertheless did assert their independence during Kuok's ownership. There have been concerns, denied by Kuok, over the forced departures, in rapid succession, of several staff and contributors who were considered critical of China's government or its supporters in Hong Kong. These included, in the mid-1990s, their popular cartoonist Larry Feign, humour columnist Nury Vittachi, and numerous China-desk staff, namely 2000–01 editorial pages editor Danny Gittings, Beijing correspondent Jasper Becker and China pages editor Willy Lam. Not long after Kuok's purchase of the newspaper, and after running several cartoons about the culling of human body parts from Chinese prisoners, Larry Feign was abruptly dismissed and his satirical comic strip "Lily Wong" axed in 1995. His firing was defended as "cost cutting", but was widely viewed as political self-censorship in the face of Hong Kong's imminent handover to the PRC. In his book North Wind, Hong Kong author Nury Vittachi documented that then editor, Jonathan Fenby, who had freshly joined from The Observer, suppressed letters querying the disappearance of the popular strip and then busied himself writing letters to international media that had covered the Feign case defending the sacking. Vittachi explained his own departure from the journal in his book, linking it to the pressures he – and other contributors – faced from top management and editors to abstain from writing on topics that were deemed "sensitive", basically in denial of the free speech rights enshrined in the Hong Kong Basic Law and the one country, two systems policy. In 2000, Fenby was succeeded by Robert Keatley, a former Wall Street Journal journalist. After the paper ran a story by Willy Lam on its front page about a delegation of Hong Kong tycoons meeting with Chinese President Jiang Zemin, in which it was reported that business opportunities in China were being offered as a quid pro quo for the tycoons' political support, the China Liaison Office raised objections of insensitivity as well as incurring the owner's wrath. Kuok berated Keatley in his office and wrote a 2-page letter, which Keatley published in the letters section of the paper. Kuok stepped down as group chairman that year. Editorial page editor Gittings complained that in January 2001 he was told to take a "realistic" view of editorial independence and ordered not to run extracts of the Tiananmen Papers, though ultimately was allowed, after protesting "strenuously", to do so. The editor had believed that there had already been sufficient coverage. At the launch of a joint report published by the Hong Kong Journalists' Association and Article 19 in July 2001, the chairman of the Hong Kong Journalists' Association said: "More and more newspapers self-censor themselves because they are controlled by either a businessman with close ties to Beijing, or part of a large enterprise, which has financial interests over the border." Editor-in-chief Wang Xiangwei, appointed by the owner in 2012 after consultation with the Liaison Office, was criticised for his decision to reduce the paper's coverage of the death of Li Wangyang on 7 June 2012. Wang, who had left the office for the day, reportedly returned to the paper after midnight to reverse the staff editors' decision to run a full story. The Post published a two-paragraph report inside the paper; other news media reported it prominently. A senior staff member who sought to understand the decision circulated the resulting email exchanges, that indicate he received a stern rebuff from Wang. Wang made a statement on 21 June, in which he said he understood the "huge responsibility to deliver news... [and]... the journalistic heritage we have inherited". and said that his decision not to pursue extensive coverage as the story broke was pending "more facts and details surrounding the circumstances of this case". Wang admitted that his decision on Li Wangyang was a bad one in retrospect. Reporter Paul Mooney said that the Li Wangyang story was not an isolated incident: Wang Xiangwei has "long had a reputation as being a censor of the news... Talk to anyone on the China reporting team at the South China Morning Post and they'll tell you a story about how Wang has cut their stories, or asked them to do an uninteresting story that was favourable to China." Mooney, who had won 10 journalistic award and whose contract with the paper was not renewed in May 2012 ostensibly because of "budgetary reasons", said that for seven months prior to his departure from the newspaper, Wang had marginalised Mooney by blocking him writing any China stories, and then hired a batch of novices mainly from mainland China after he had been ousted. Despite the reported sentiments of the owners, the Post does report on commemorations of the Tiananmen Square Massacre, and ran an editorial criticising the one-child policy in 2013. The SCMP published an interview with Jack Ma, founder of Alibaba, in which Ma defended late Chinese leader Deng Xiaoping's decision to crack down on pro-democracy student protests, saying it was "the most correct decision". The relevant remark was deleted not long after the article was published; the reporter responsible for the interview was suspended and later was resigned. Alibaba said that Ma had been quoted "improperly", and demanded a rectification, but the editor-in-chief refused. During Alibaba's failed attempt at securing an initial public offering on the Hong Kong Stock Exchange, the Post published articles questioning the business practices of the platform, including the abundant existence of counterfeit goods. The announcement of ownership changes at its parent company on 11 December 2015 sparked concerns that the journal would become another mouthpiece of the Central People's Government. Among the motives of the Alibaba acquisition was to make media coverage of China “objective, fair and accurate” and not in the optic of Western news outlets. Alibaba asserted that the journal's editorial independence would be assured. Joseph Tsai, executive vice-chairman of Alibaba Group, said that the fear that Alibaba's ownership would compromise editorial independence "reflects a bias of its own, as if to say newspaper owners must espouse certain views, while those that hold opposing views are 'unfit'. In fact, that is exactly why we think the world needs a plurality of views when it comes to China coverage. China's rise as an economic power and its importance to world stability is too important for there to be a singular thesis." He also said, "Today when I see mainstream western news organisations cover China, they cover it through a very particular lens. It is through the lens that China is a communist state and everything kind of follows from that. A lot of journalists working with these western media organisations may not agree with the system of governance in China and that taints their view of coverage." Since the Alibaba acquisition the South China Morning Post has discontinued several subsidiary publications, including its Chinese language edition, the 48 HOURS weekend magazine, and the popular HK Magazine alternative weekly. The 48 HOURS staff continue to write on other SCMP platforms. The closures have been viewed as part of a wider effort under Alibaba management to shift focus away from Hong Kong and onto mainland China, and to market that coverage to western readers overseas, in order to correct what Alibaba's executive vice chairman called "the wrong perception of China" among foreigners. "The South China Morning Post purchased us at the right time, and for sensible reasons. The media landscape was changing dramatically, as it continues to do, and their ownership bought us a few final years of life. But, like “One Country, Two Systems,” this odd and uncomfortable marriage was never going to last. As this sad end to HK Magazine shows, it is clear that it is time now for someone else to step up and provide an alternative voice for Hong Kong. If you care about free speech and the liberal values that make Hong Kong what it is, say something about it. Do something about it. Support independent outlets like Hong Kong Free Press and FactWire. You have a voice. Use it. Or you will surely lose it." Initially SCMP stated that the HK Magazine website would be deleted from the internet, but this received strong condemnation. The Hong Kong Journalists Association lodged an inquiry with SCMP management. Hines stated, "It is unthinkable that a newspaper of record would ever consider deleting content from its archive. The SCMP should be held to proper journalistic standards. HK Magazine was an important feature of Hong Kong’s media landscape, and it must be preserved. Deleting it would be an utter travesty of journalistic principles – and a slap in the face to SCMP’s readers and to Hong Kong society in general." Following the negative reaction, SCMP stated that HK Magazine content would be migrated to the South China Morning Post website before the HK Magazine website was deleted. Additionally, Hong Kong data scientist Mart van de Ven launched a public appeal to help archive back issues of the magazine, expressing doubt that SCMP would preserve the full archive. However, he found that he was unable to access issue 1,103, which featured Leung Chun-ying on the cover. On 22 July 2017, the SCMP published an article linking Xi Jinping, General Secretary of the Communist Party of China, to a Singaporean investor. It was quickly removed and a correction was issued claiming the author used unverifiable claims as the basis of the article. "(...) the spectacle’s producers included not just the usual propaganda arms of the regime (e.g. the Xinhua News Agency, etc. ), but also the formerly independent South China Morning Post (SCMP) of Hong Kong. In agreeing to ‘interview’ a torture victim in between the torture sessions, the paper gave in to pressure from China". As a result of this incident, Fiskesjö concluded that "the SCMP can no longer be trusted as an independent news organisation." Taxi advertising in Central for the Classified Post by SCMP. Before the acquisition in 2016 by Alibaba, South China Morning Post belonged to the SCMP Group, a company also involved in property investment and convenience store operation. In April 2016, the company announced that the transaction of their media businesses with Alibaba was completed. As the intellectual property rights to the name "SCMP" was also transferred, the company changed its name to Armada Holdings Limited, then to Great Wall Pan Asia Holdings. ^ a b c "Paywall down as Alibaba takes ownership of SCMP". SCMP.com. ^ a b c d e f g "Alibaba Buys HK's SCMP to Counter 'Western Bias'". Asia Sentinel. ^ a b "Alibaba to Buy South China Morning Post". The Wall Street Journal. 11 December 2015. Retrieved 11 December 2015. ^ Chinese University of Hong Kong Centre for Communication and Public Opinion Survey (2016). Public Evaluation of Media Credibility: Survey Results (PDF) (Report). Chinese University of Hong Kong. p. 2. ^ a b c d "How the SCMP sale adds up for Kuok and Ma". EJ Insight. ^ "Khoon-Ean Kuok: Executive Profile & Biography - Bloomberg". www.bloomberg.com. Retrieved 30 May 2018. ^ Matt Eaton (9 December 2008). "Senior shuffle sees Kuok tighten grip". Marketing-Interactive.Com. LightHouse Independent Media Pte Ltd. Retrieved 14 April 2010. ^ a b c Sam Byford (14 December 2015). "Alibaba buys South China Morning Post to 'improve China's image'". The Verge. ^ a b "Paywall down as Alibaba takes ownership of SCMP". ^ "SCMP Delivers More Readers Than Ever". South China Morning Post. Archived from the original on 16 April 2014. Retrieved 13 April 2014. ^ "Audit Report". Hong Kong Audit Bureau of Circulations. Retrieved 21 March 2007. ^ a b Smith, Patrick (19 November 2006). "Clash of civilizations at Hong Kong newspaper". International Herald Tribune. Retrieved 22 March 2007. ^ "Two more top editors leave South China Morning Post". International Herald Tribune. 29 January 2007. Retrieved 21 March 2007. ^ "Ad revenue lifts SCMP profit 37pc". South China Morning Post. 27 March 2007. ^ "HOME – SCMP". Archived from the original on 14 March 2012. ^ "News Digest". South China Morning Post. 26 March 2007. p. 1. ^ García Media. "South China Morning Post: new beginnings in a new Hong Kong, new China". ^ "The South China Morning Post iPad edition on iTunes Store". South China Morning Post. Retrieved 25 July 2012. ^ a b c d "Breaking: Jack Ma's Alibaba buys South China Morning Post, paywall to be scrapped". Hong Kong Free Press. ^ a b "隔牆有耳：《南早》赤化　政協做老總". Apple Daily (in Chinese). ^ "SCMP Group Executive Appointment and Changes". South China Morning Post (Press release). Hong Kong. 3 February 2006. Archived from the original on 16 July 2011. Retrieved 7 December 2006. ^ "Top Editor Forced to Resign at South China Morning Post". Asia Sentinel. ^ Brook, Stephen (14 November 2006). "Subs sacked over leaving page". The Guardian. UK. Retrieved 21 March 2007. ^ "Editor quits Post after bitter year". The Standard. Hong Kong. 20 March 2007. Archived from the original on 22 May 2011. Retrieved 21 March 2007. ^ "Reginald Chua, Editor-in-Chief of the South China Morning Post". ^ a b "South China Morning Post (SCMP) Appoints Veteran Wang Xiangwei as New Editor-in-Chief". Marketwire. ^ "SCMP names new editor-in-chief". RTHK. 31 January 2012. Retrieved 23 May 2015. ^ a b "Leading Columnists Purged at Hong Kong's Paper of Record". Asia Sentinel. 20 May 2015. ^ "SCMP ditches columns by veteran journalists". RTHK. 20 May 2015. ^ Kwok, Ben (20 May 2015). "SCMP ditches veteran columnists Bowring, Rafferty and Vines". Hong Kong Economic Journal. ^ Tom Grundy (6 November 2015). "South China Morning Post announces new editor-in-chief amid mass exodus of staff | Hong Kong Free Press". Hong Kong Free Press. Retrieved 7 November 2015. ^ Stephen J. Hutcheon, "Pressing Concerns: Hong Kong’s Media in an Era of Transition"
^ Pomfret, James; Tang, Sisi. Reuters (20 June 2012). "China casts long shadow as Hong Kong paper stands accused of censorship". The Republic Archived from the original on 21 June 2012. ^ Wang Xiangwei, (21 June 2012). "Statement by the Editor-in-Chief". South China Morning Post. ^ "SCMP editor Wang Xiangwei admits "bad call"". ^ "Veteran reporter Paul Mooney tells how he got sidelined by new SCMP editor Wang Xiangwei". ^ "Hong Kong commemorates Tiananmen Square crackdown victims". South China Morning Post. 4 June 2013. Retrieved 10 June 2013. ^ Chan, Minnie (30 May 2013). "China's one-child policy causes silent suffering of mothers". South China Morning Post. Retrieved 10 June 2013. ^ "Alibaba in talks to invest in SCMP Group, China Daily says". Hong Kong Free Press. ^ Barboza, David (12 December 2015). "Alibaba Buying South China Morning Post, Aiming to Influence Media". The New York Times. ^ a b "Letter to readers of the South China Morning Post, from Alibaba's executive vice chairman". South China Morning Post. 11 December 2015. ^ a b Phillips, Tom (25 July 2016). "Mysterious confession fuels fears of Beijing's influence on Hong Kong's top newspaper". the Guardian. Retrieved 26 July 2016. ^ Tsoi, Grace (7 October 2016). "The death of an irreverent Hong Kong magazine". BBC News. ^ Grundy, Tom (28 September 2016). "South China Morning Post confirms closure of HK Magazine after 25 years in print – website to be deleted". Hong Kong Free Press. ^ Hines, Zach (30 September 2016). "A sad end: HK Magazine was the canary in the coal mine". Hong Kong Free Press. ^ Grundy, Tom (30 September 2016). "SCMP says HK Magazine online content will be saved". Hong Kong Free Press. ^ a b Grundy, Tom (3 October 2016). "Data scientist asks fans to help archive content from soon-to-be-axed HK Magazine". Hong Kong Free Press. ^ Grundy, Tom (21 July 2017). "South China Morning Post removes article linking Chinese President Xi Jinping to Singaporean investor". Hong Kong Free Press HKFP. Retrieved 21 July 2017. ^ a b "Confessions Made in China". 3 May 2018. ^ Tam, Inti. "SCMP Group intends to rename as Armada Holdings". Marketing Interactive. Retrieved 13 June 2018. ^ "SCMP Group to be renamed Armada after selling newspaper". EJ Insight. 19 February 2016. Retrieved 13 June 2018. ^ "Our Business – South China Morning Post". South China Morning Post Publishers Limited. Retrieved 12 June 2018. ^ "Profile: Gary Botting". ABC Bookworld. 2011. Archived from the original on 25 October 2010. Retrieved 9 November 2012. ^ Gary Botting, "The Descent of 20 Battery," South China Sunday Post-Herald, 31 March 1963; Gary Botting, "The Death or Glory Boys in Macau," South China Sunday Post-Herald, 16 June 1963; Gary Botting, "A Corporal at Ten," South China Sunday Post-Herald, 16 June 1983; Gary Botting, "She's a Bit of Portugal Afloat," South China Sunday Post-Herald, 23 June 1963, p. 26. ^ "Jonathan Fenby to resign as editor of Post after 'four momentous years'". South China Morning Post. 16 June 1999. Retrieved 25 January 2013. ^ "Explorers: Ma Jun". National Geographic. Retrieved 26 July 2012.